Need to learn more about your new neighborhood? As you search for a home in your new destination, CityPointeSM can provide temporary housing with our reduced rates at more than 400,000 apartments in more than 2,000 U.S. cities. You can use the CityPointeSM program to help you qualify for cash reimbursements*. If you make use of the full array of services through the CityPointeSM program, you may be eligible for cash reimbursements of approximately $5 per $1,000 of your home's value on both the origin and destination side of your move. *Reimbursements are based on home value. In order to be eligible, customers must close their sale through CityPointe'sSM real estate network and home value must exceed $100,000. 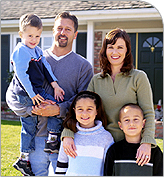 Certain moving expenses are tax-deductible less any reimbursements that you receive. Please ask your United agent for details about the program.